I'm going to continue with the theme of presenting recipes from from my kids' cooking. I'm in Seattle this week visiting with the kids, and enjoying some great food and company. Our first night here we had dinner with our middle son, Aaron and his wonderful partner, Erica. Aaron cooked a delicious and beautiful meal that started with an excellent spinach salad. Aaron doesn't really use recipes - he makes things up as he goes along - but he tried to pay attention to measurements because he knew I wanted to post the recipes. Process all ingredients in a blender until smooth. Add salt and fresh ground pepper to taste. Mix all ingredients in a large bowl. Toss with dressing and serve. The addition of fruit in the dressing sounds wonderful--I think I will have to try this one! Mmmmmmm..... sounds delicious. We had spinach salad for dinner too, along with our "chicken." Someone gave us watercress, which was a great addition. That sounds yummy. I make a similar spinach salad but it never occurred to me to put fruit in the dressing. Definitely going to try that. Thanks for your comments, Ricki, Claire and Jenny! When I tasted the salad I was surprised by the intense flavor. It was different from other spinach salads I've had. And when I got the recipe and found it included fruit, I was doubly surprised. 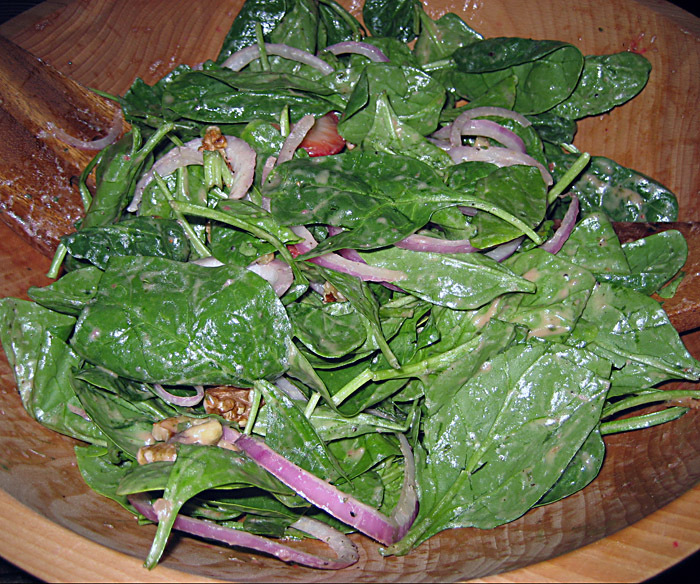 The fruit definitely add a new dimension to the old spinach salad.